It has been a very busy and frenzied week for me. And I won't be blogging much (again) in the next few weeks since I will be away on vacation (Yey!). AND I am very happy because I received a bunch of treasures from my online buddies last week. I am grateful for the friendship and happy that my blogger friends still find my blog "award-worthy". Thanks for the thoughts guys! Hugs to you all! 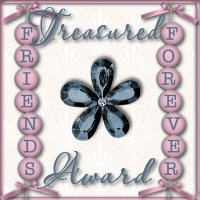 The Treasured Award from Umma of Happy Moments, Happy Thoughts and the One Lovely Blog Award from Chris of The Mommy Journey. 1. Nominate another 10 bloggers that you really love to visit their blog. 2. Put the logo in your blog and link to the person who gave you the award. thank you! Thank you! you’re wonderful Kikamz! and have a lovely week!